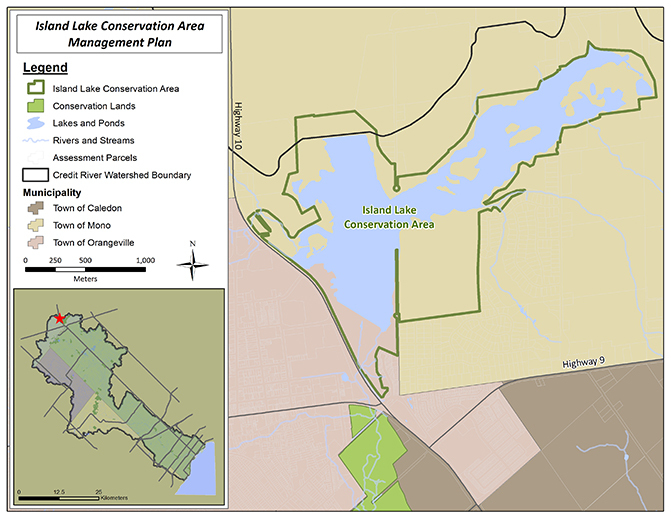 CVC is excited to announce the initiation of the Island Lake Conservation Area Master Plan. Master Plans establish conservation area goals and objectives and provide strategies for achieving them. A Master Plan also provides land managers and stakeholders with a long-term vision for the conservation area as well as direction for guiding the management of the property. It advises day-to-day operational decisions as well as complex problems by clarifying and prioritizing actions to successfully manage the conservation area. Located at the headwaters of the Credit River in the Towns of Mono and Orangeville, both in the County of Dufferin, Island Lake Conservation Area (ILCA) was one of CVC’s first land securement projects which began in 1957. Formerly known as Orangeville Reservoir Conservation Area, ILCA was created with the construction of two dams in 1967. The reservoir was designed to maintain water quality and quantity through controlled outflows into the Credit River and to provide an outstanding recreational resource for the headwaters region. Today ILCA is one of CVC’s largest conservation areas spanning 329 hectares (812 acres) and is characterized by a large reservoir lake surrounded by wetlands, upland forest, plantations and meadows. ILCA is one of CVC’s four operational conservation areas and is one of the best recreational environments in our watershed, providing visitors with four seasons of activities and experiences. Though first opened to the public in 1970, the conservation area was not fully operational until 1980 after the completion of the Orangeville Reservoir Conservation Area Master Plan (1979). The most recent Master Plan for ILCA was completed in 1997 and outlined goals and directions for the property for a 20 year period. The 1997 Master Plan set the stage for the development of several key features such as the boat launch, docks, main picnic pavilion, new washroom facilities and extensive trail system. The 1997 Master Plan was most recently revised through an addendum in 2005 but will expire in 2017. The master plan planning process provides the mechanism to holistically analyze opportunities, address multiple objectives and integrate recommended solutions into a framework for managing and developing the conservation area. As a holistic decision-making process, management planning balances a science-based methodology with a community-driven approach. It is designed to engage municipal and provincial agencies, upper and lower tier municipalities, partner groups and the general public to balance all objectives and comments with the strategic goals of CVC and its conservation area system. Follow progress on the Island Lake Conservation Area Master Plan on CVC’s website and check back for updates on when Public Information Sessions will be held in 2016.